Shri. Totaram Bhojraj Lulla, a renowned name in the field of taxation, migrated in 1947 to India along with his father, mother, brothers & sisters after leaving behind well earned money & well settled property. His family was staying at Shikarpur in Sindh Prant. He was one of the lakhs of Sindhi people who fortunately could save their lives in spite of slaying in the train from Sindh to Gujrat. Born on 12th Oct 1935, he completed his post graduation of Law degree from Govt Law College, Mumbai. For his fees & expenses, he sold toffees in local trains of Mumbai. 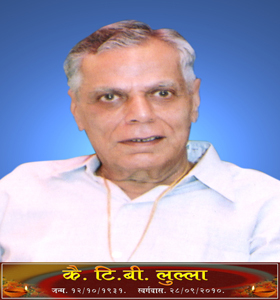 As a Sales Tax inspector from Mumbai he was transferred to Kolhapur & then to Sangli, where he started practice in taxation in the year 1958, after resigning from the Sales Tax Department. Due to his calm, quiet & non greedy nature, he became “DADDY”, not only of his two sons but also of entire community. A book “Sindhu te Krishna” was published when he was 71, to present before the Maharashtrian Community about the struggle faced by entire Sindhi’s at the time of partition. He passed away on 28th Sept 2010 leaving behind his wife, two sons, grandson & grand daughters. The achievements in his life are commendable. After achieving success in the field of taxation since 1980 & also in the field of Land Development since 1995, Adv. Kishor Lulla decided to diversify his activities towards social & charitable purposes in the year 2010 immediately after sad demise of his father on 28-Sept-2010. In other words, he realized where to stop earning & come out of day to day engagement in business & profession at the age of fifty. His vision is to support the Genuine Non Government Social Organizations not only by monetary help but by providing them knowledge of running the organizations successfully in every aspect. The ultimate aim is to form a “Federation of NGO’s” which should create a pressure group over the ill elements of the society. From 2014 onwards the foundation has decided to work in the field of primary & secondary education. Our mission is to support the Genuine Non Government Social Welfare Organizations (FSOW) not only by monetary help but by providing them knowledge of running the organizations successfully in every aspect. The ultimate aim is to form a “Federation of FSOW” which should create a pressure group over the ill elements of the society. Another mission is to make the education happy & practical of primary & secondary children. To give monetary help to the social organizations & also to give exposure to their work & to their products in front of society. For this following programmes were arranged. After the sad demise of his father of T.B.Lulla on 28th Sept 2010, Kishor Lulla decided to start a unique social trend called “Arghyadan” [donations money to needy Social Organizations] and donated large sum to various Social Organizations on 28th November 2010. Due to overwhelming response from society, this initiation continued and in the next year, on “Seva 2011” was organized on 2nd and 3rd Oct, where platform was provided to more than 100 Social Organizations to interact with society and donors. In year 2012 on 2nd Oct another unique concept “Kalavishkar 2012” was arranged and a platform was provided to folk artists from Sangli district and nearby area. All the events were free of cost for the Social Organizations. On 7th to 9th December 2013, a State Level Exhibition of Social Organizations “Seva 2013” will be organized consisting of 125 stalls of NGO’s to give them exposure before the public at large as well as the proposed donors from the society. A positive foot step towards formation of “Federation of Non Government Social Organizations” to build a pressure group for social cause. From 1st Dec. 2014 To 14th Dec. 2014 foundation conducted 200 workshops in 100 schools about the practical & happy education under the head "Shiku Aanande 2014".